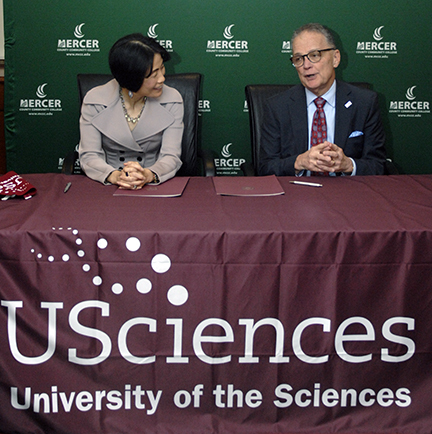 MCCC President Dr. Jianping Wang and USciences President Dr. Paul Katz speak following the signing of a guranteed transfer agreement between the two institutions. WEST WINDSOR – Mercer County Community College (MCCC) students pursuing a career in math, engineering, or the sciences can now transfer to University of the Sciences in Philadelphia (USciences) with full junior status under a new guaranteed transfer agreement signed by the two institutions Oct. 20. University of the Sciences has prepared students to be leaders and practitioners in the healthcare and science fields for nearly 200 years. Since its founding in 1821 as Philadelphia College of Pharmacy, USciences has grown to more than 30 degree-granting programs from bachelor’s through doctoral degrees in the health sciences, bench sciences, and healthcare business and policy fields.